Horses are so great. And always something going on. Like, say, I wake up the other morning, the dogs are going nuts, and I see a horse where she doesn't belong. On the wrong side of the fence, in the neighbor's yard. Oh, yeah, she broke the gate off the hinges and went for a constitutional. And took her buddy with her. Guess they got the idea from the yearling fillies after they crashed through the fence!! Never a dull moment. You can check out a bit about the farm, and see an awesome video here: Classiebawn Farm The video was made at the Parelli Center in Pagosa Springs, Colorado. If you love horses, you gotta watch it! OK, I've managed to get completely off the subject of teapots, but horses are my "other" passion, so you'll have to excuse me if I digress once in a while. The "Collector's Guide" will be ready shortly, and I'll post it on the website. 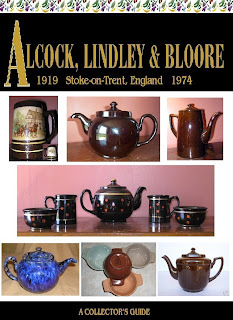 I'm waiting for some info from Staffordshire and have some more photos to add, but that shouldn't take too long. There is still time for submissions, so feel free to send anything you think would make the guide more interesting or helpful to collectors. Guess that's enough for now. Maybe we'll talk animals next time. Just for a change, and because I just LOVE animals! !